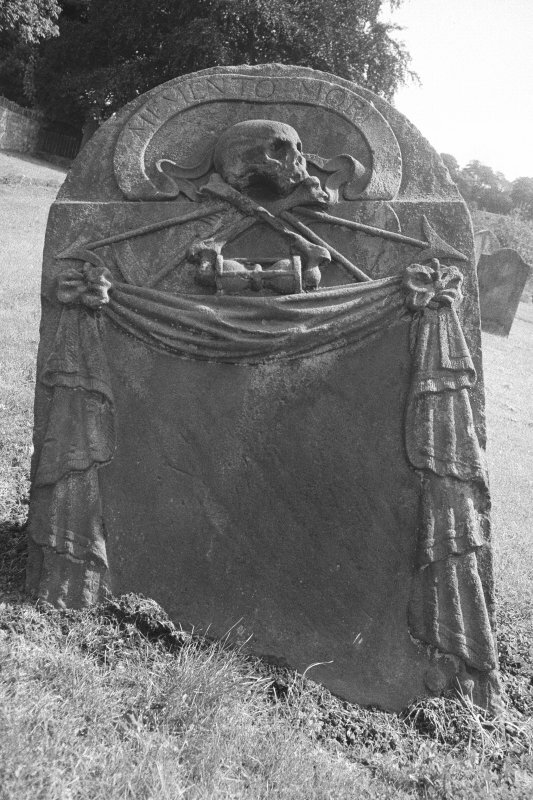 View of gravestone 'Ann Calvell and Agnes Nisbet d. 1757' (Willson) Skull top centre with 'MEMENTO MORI' on carved ribbon, over X bones, arrows, scythes, hourglass and swag. 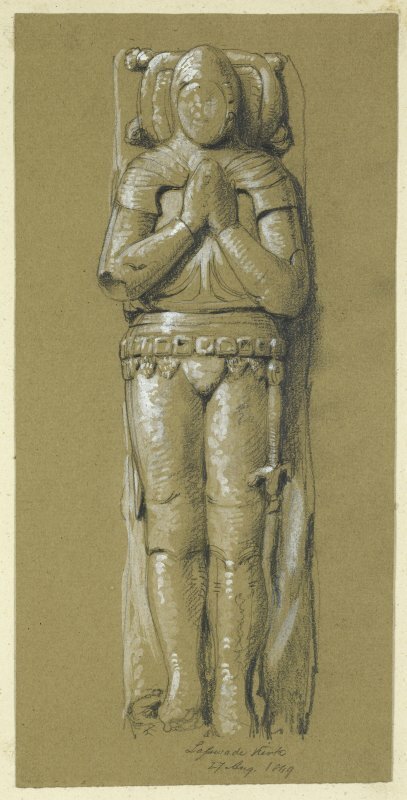 Drawing showing general view from N. Insc. 'North View of Old Church at Lasswade. Sketched from nature by Alex. Archer. 1839'. 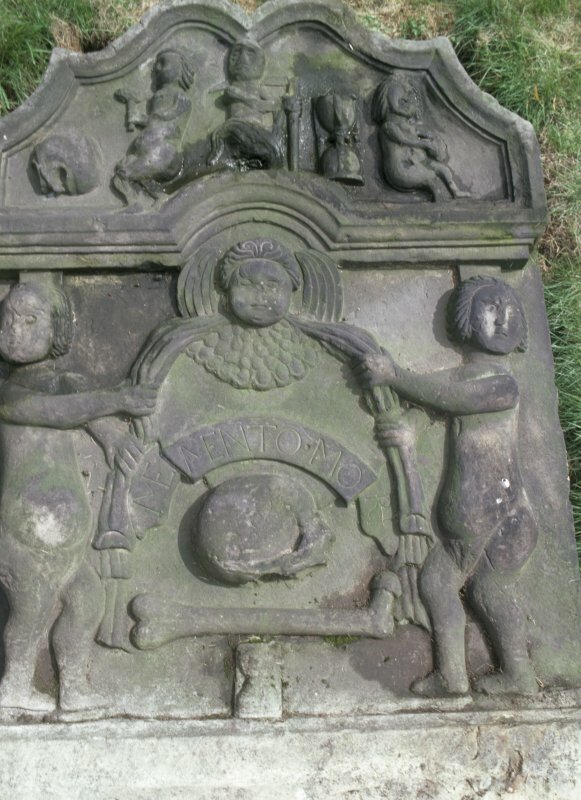 Detail of W face of gravestone 'William Drover d. 1742' (Drover). Showing winged soul head over fronds and swag, with skulls on sides. 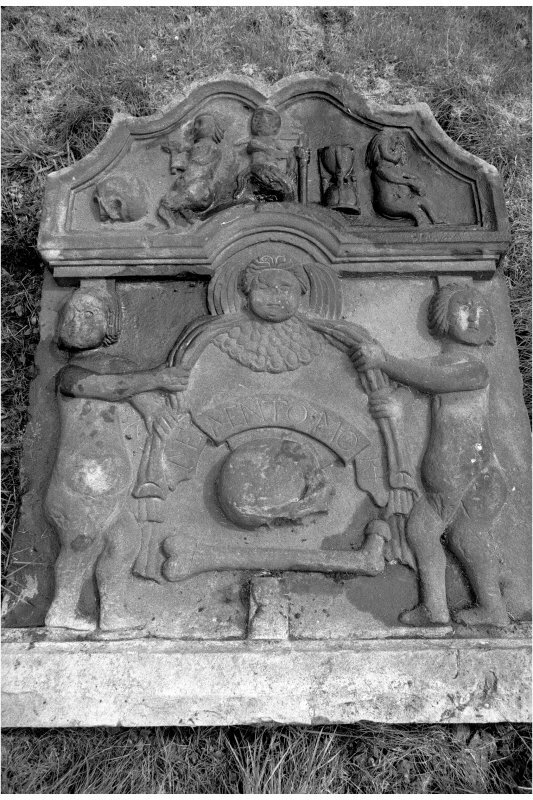 Detail of graveslab with carved angels, Lasswade Old Parish Churchyard. Photographic copy of ink sketch plan of Lasswade Church. Insc. "Old Kirk of Lasswade without scale. Nov.r 4 1858. J.S." 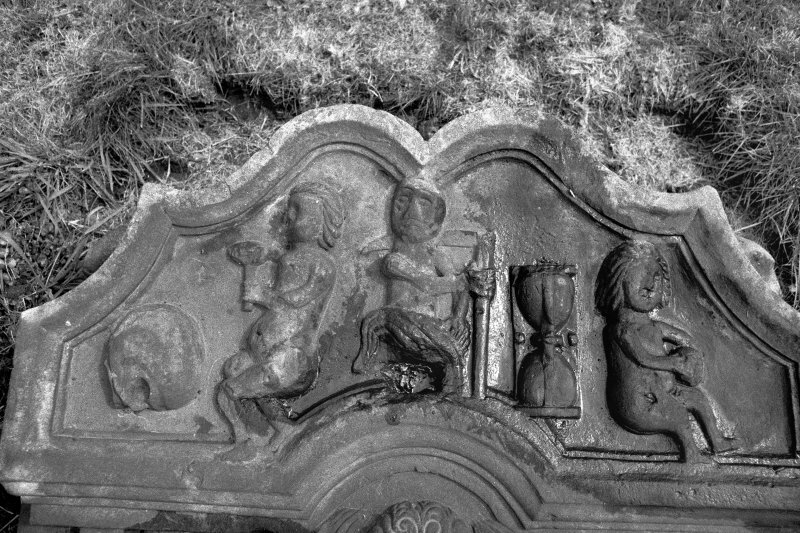 Detail of headstone to Iain Laidlaw d. 1739, Lasswade Old Parish Churchyard. Drawing showing general view from S. Insc. 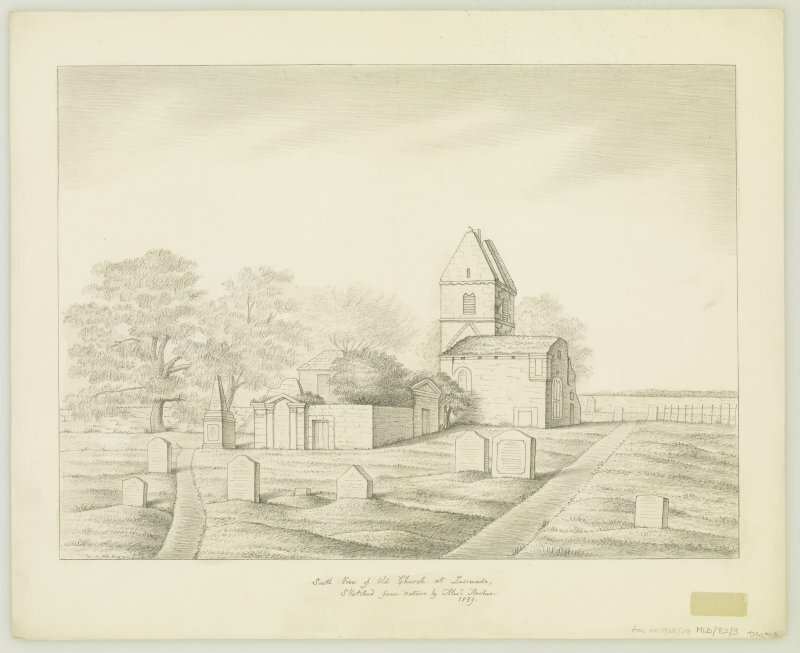 'South View of Old Church at Lasswade, Sketched from nature by Alex Archer. 1839'. 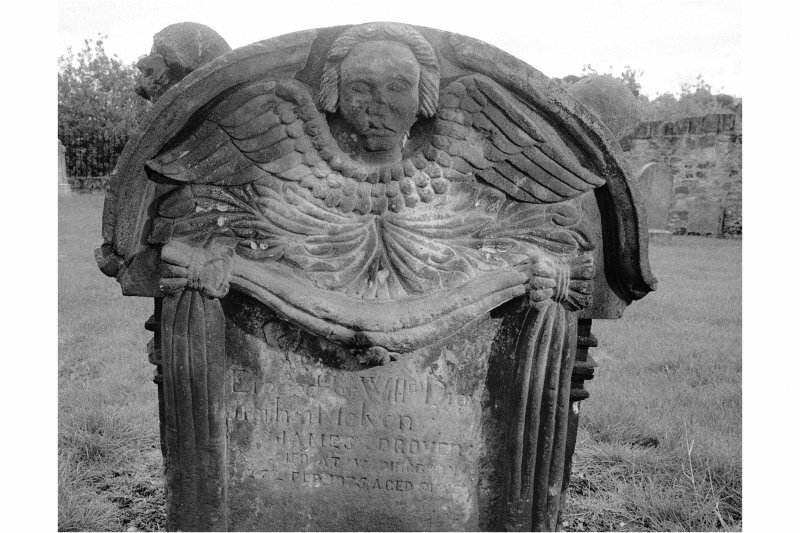 View of headstone to Marion McKenzie d. 1767, Lasswade Old Parish Churchyard. 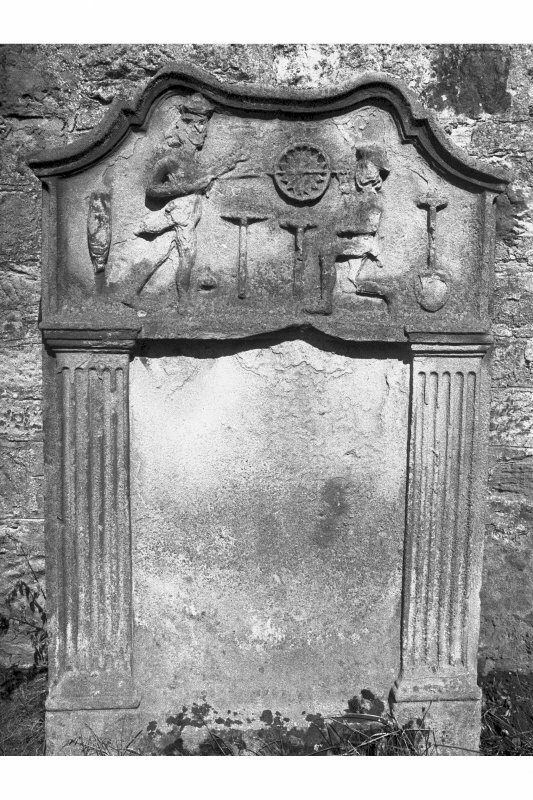 View of gravestone 'Marion McKenzie d.1767' (Ross) showing carved tools and two figures, possibly surveying. View of gravestone 'William Drover d. 1742' (Drover). 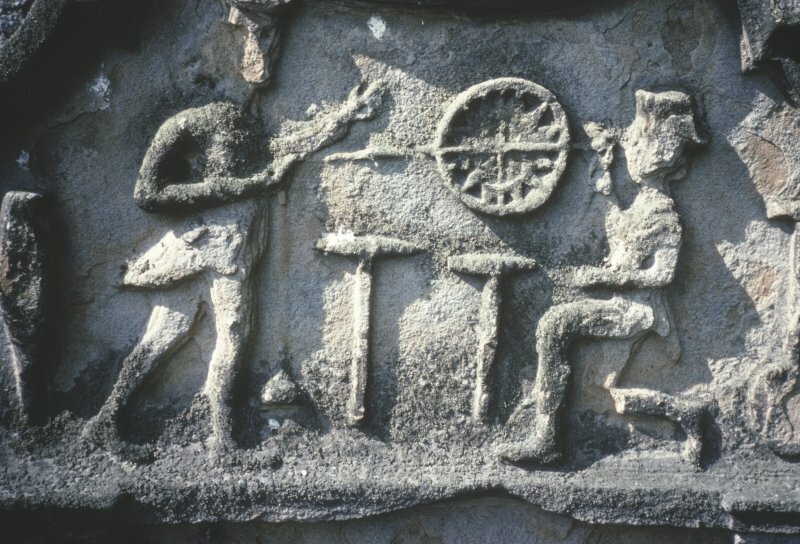 Showing a central crown and hammer with fronds and a swag surrounding the inscription. Two skulls on sides of stone. 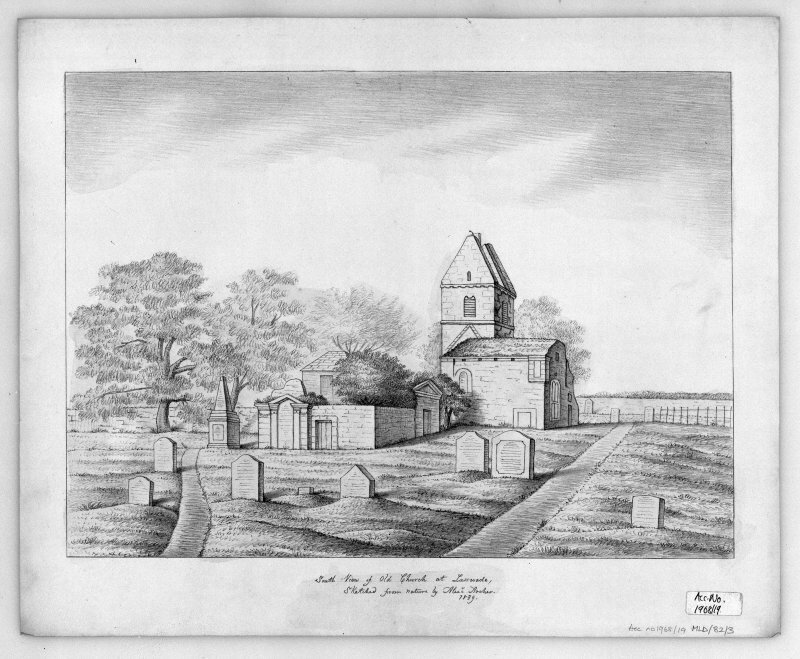 Photographic copy of drawing showing view of old Church and Churchyard from the North. Insc. 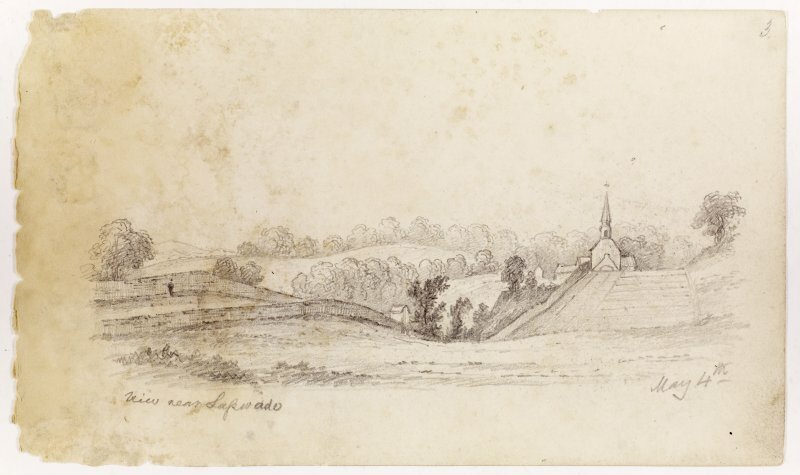 'North view of Old Church at Lasswade, sketched from nature by Alex. Archer. 1839'. Photographic copy of drawing showing general view with river, houses and man fishing. 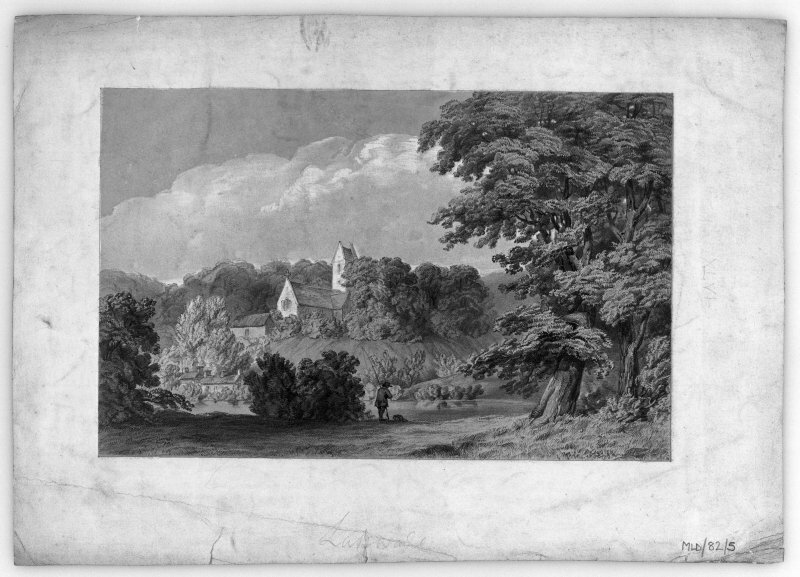 Photographic copy of drawing showing view of old Church and Churchyard from the S. Insc: 'South view of Old Church at Lasswade, sketched from nature by Alex. Archer. 1839'. 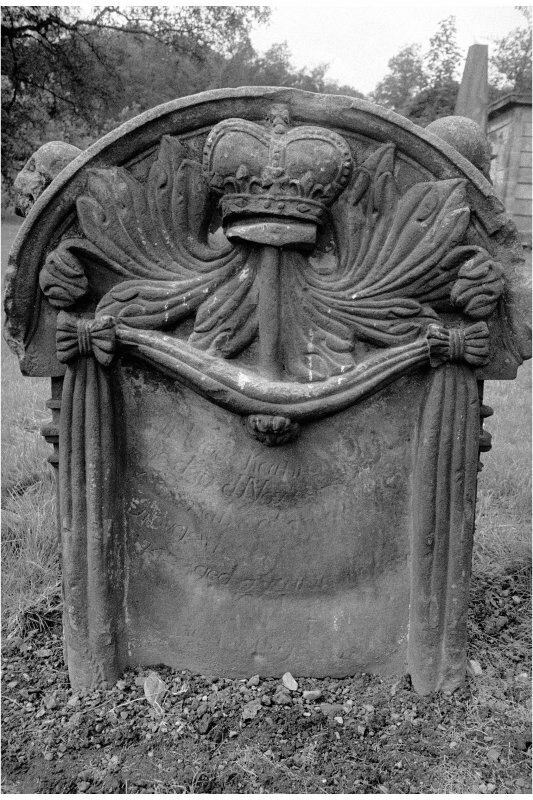 Detail of graveslab, Lasswade Old Parish Churchyard. 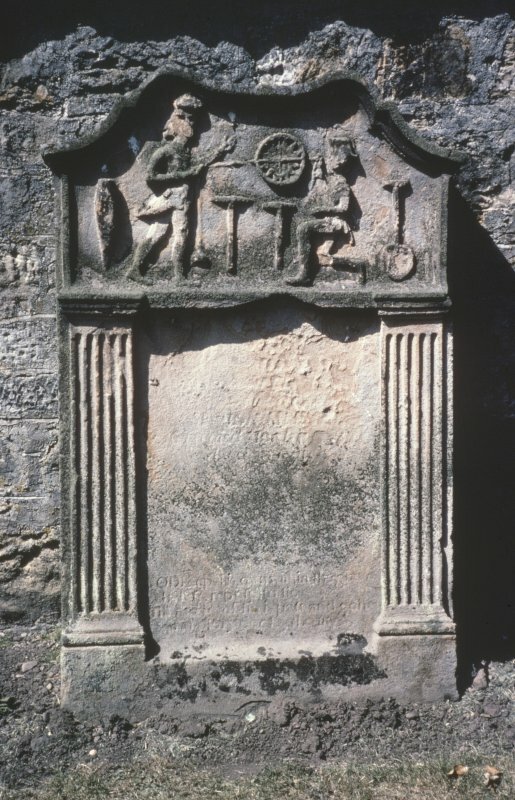 Detail of gravestone showing surveyor working in mine, Lasswade Old Parish Churchyard. Evidence for discovery: found re-used in the ruins of the thirteenth-century church in or before 1867 when it was donated to the museum. Present condition: broken and worn. This is most likely to have been the left-hand arm of a free-standing cross, ornamented in relief on the two main faces. It is of cusped and square-ended form. Within a plain flatband moulding, face A bears the hand of the crucified Christ with a nail through it, and face C contains an animal whose tail curves between its hind legs. Its head shows a round eye and triangular ear and an elongated tongue protrudes from its wide-open jaws. Date: tenth or eleventh century. References: ECMS pt 3, 423-4. 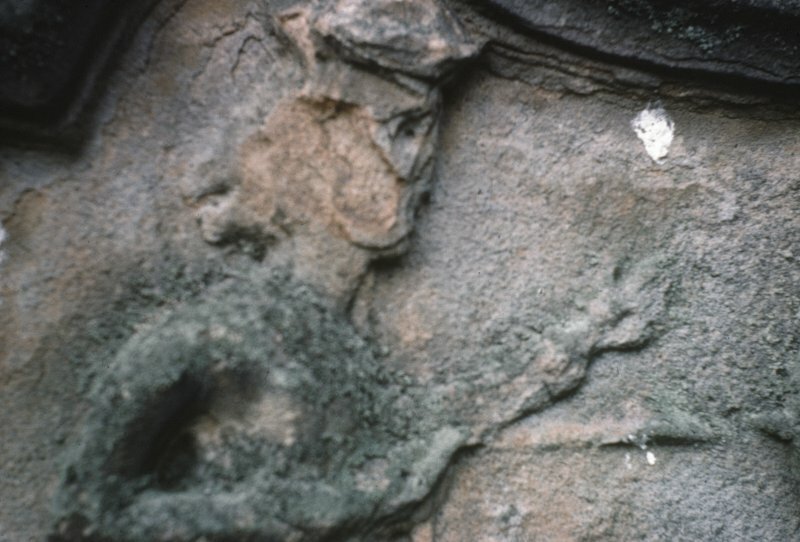 This fragment of a larger slab is carved in relief on one face only with a panel containing a quadruped with long tail curving up and over its back. Behind it is part of a panel of diced work. The old parish church of Lasswade which was dedicated to St Edwin was built in the early 13th c. It was allowed to become ruinous after 1793 when a new church was erected (at NT 3012 6612). 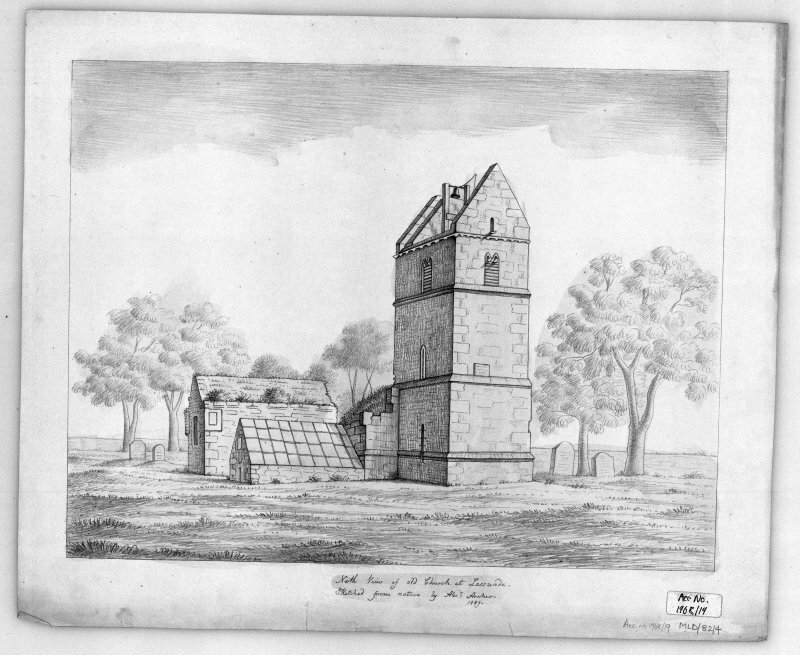 It consisted of a single oblong chamber 20' in width, with a tower 16' square at the W end. The aisle, on the N, was preserved and converted into a mausoleum in the 17th century Henry Dundas, First Lord Melville, is buried in it. W of it is the mausoleum of the poet Drummond of Hawthornden (died 1649): this was restored in 1892 when a medieval floriated finial cross, presumably from the old church, was erected above the entrance. The tower fell in 1866, and now all that remains of the rest of the church is a 13th century fragment of the S wall. The present remains of the church are as described. Though considerably ruined, the existing ivy-covered walls are in fair condition. There is a striking Transitional window in the N wall of the N aisle. A modern burial vault on the S appears to be on the foundations of the early choir, and a fragment of the S wall of the nave is to be seen W of this vault. 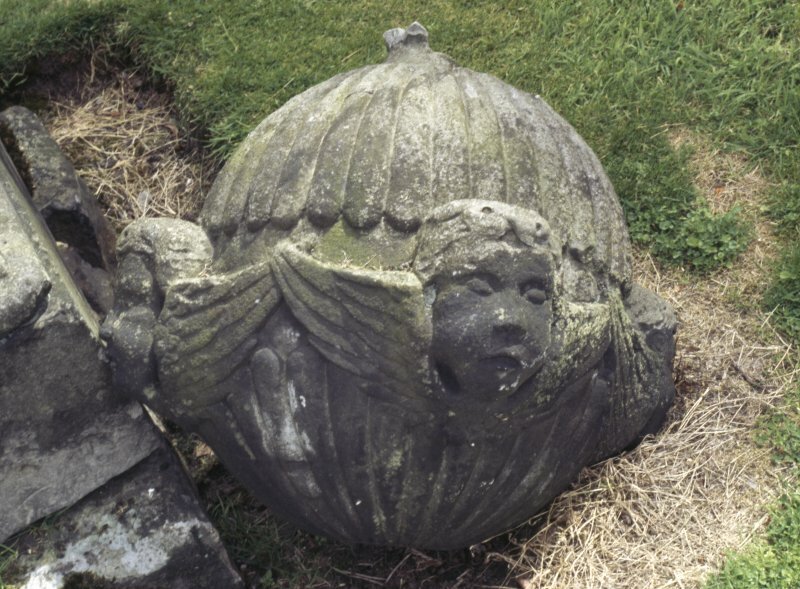 In the 19th century two sculptured stones were found in the ruins of the church. One (Royal Museum of Scotland [RMS] IB 21) is a side-arm from a free-standing cross which is carved in relief with, on the front, the Saviour's hand pierced by a nail, and, on the back, a beast; the other (RMS IB 20), which is also carved in relief, bears a four-legged beast and a border of diced work. J Allen and J R Anderson 1903; RCAHMS 1988. This church was demolished 1955/56. Information from Demolitions catalogue held in RCAHMS library. Report on the condition of the Church by George Paterson (-D.1789) and William Robertson (-), architects. Consideration by the Presbytery of the alternate plans and estimates for extensive repairs or for a new Church. 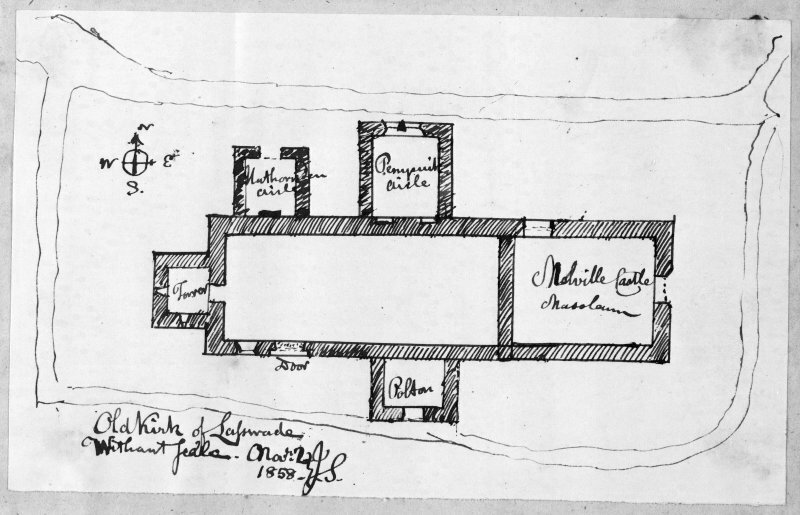 Plans and estimate for the repair of the Church. The Presbytery accepted Mr. Paterson's plan to cut off the 3 Arches from the West end of the Church and take in a space from the East. The west Gavel was to be brought forward to the Hammermen's Loft. It was agreed to employ Messers. Paterson and Young for the work. Extracts of a Decree of Presbytery of Kinghorn.